Nowadays 802.11n wireless technology is on the way replacing conventional 802.11a/b/g protocols with higher bandwidth. Although there are already quite a number of networking products that is compatible with 802.11n standard, but most of them are being built with main focus on high performance without much design consideration to make them as smallest as possible. Now Buffalo, the famous Japanese maker has tried to come out a new product but with a slightly different approach, focusing on the small form factor USB dongle for those that would like to have greater portability. 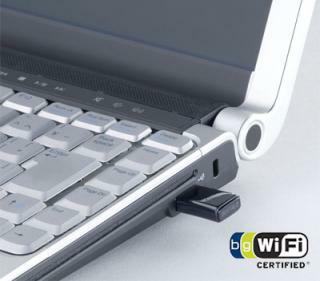 Known as WLI-UC-GN, it is claimed to be the world’s tiniest 802.11n Draft N compliant ready for consumer markets. Measured at only 16mm X 33mm X 8mm, the device is suitable to be carried around in pocket and used anywhere for seamless connectivity. Unlike conventional 802.11n compliant router that comes with MIMO (Multiple Input Multiple Output) antenna, the new dongle consists of a built in omni-directional antenna that may somehow affect its maximum throughput as well as coverage range. As compared to normal 802.11n device that can achieve 300Mbps, the device is expected to be able to reach 150Mbps, which is relatively lower than normal, but still far more than sufficient to receive media streaming to the from access point. The device will be available in Japan market by next month at a retail price of $23. Even though it doesn’t have the similar performance in terms of throughput and range, but it will definitely be a good replacement for existing 802.11a/b/g with at least three fold performance boost as compared to conventional 802.11a/b/g wireless technology.